iGO Rewards is coming soon. iGO Rewards is powered by Mastercard Loyalty Solutions (Hong Kong), a Mastercard company. Thank you for using iGO Rewards! Please bear with us. We are busy upgrading to serve you better till 27th Nov 2017, 7am. Use your DBS$ or COMPASS dollar to redeem flights, accommodations or create your own travel packages at any time! Please visit http://go.dbs.com/hk-iGO-en for details. With iGO Rewards, you can book travel for anyone, as long as you are the Principal Cardholder of eligible DBS credit card. Can I make a booking and choose not to redeem my DBS$ or COMPASS dollar? No. To complete each booking transaction, you are required to use a minimum of 100 DBS$ or COMPASS dollar. Can I switch to another DBS Credit Card used during booking process? To switch to another DBS Credit Card during booking process, please click ‘Return to DBS’ in the user menu on the top left of the home page to go back to DBS Omni Website to start again with your preferred card. Can I make a booking via the iGO Rewards Travel Services Centre? No. iGO Rewards Travel Services Centre takes booking changes and cancellations only. What do I do if I have multiple stopovers for my travel? Multiple stopover booking option is not available in iGO Rewards currently, however we look forward to providing you with this option in the next platform upgrade. Flight - The majority of international flight bookings can be booked for travel a minimum of three days in advance of the departure date but this varies slightly by airline. Hotel - You can usually book hotel accommodation one day in advance prior to your check-in date but this varies by hotel. Can I select the amount of DBS$ or COMPASS dollar to be used for booking? Yes. On the payment page you can select the amount of DBS$ or COMPASS dollar you want to use by moving the Payment Slider from left to right. This will automatically calculate the amount of Hong Kong dollars that will be due. The amount due in Hong Kong dollars must be payable by the same DBS credit card you signed in with which will also be validated at the time of payment to verify identity and authenticate the transaction. A minimum of 100 DBS$ or COMPASS dollar is required to complete each booking. How do I know my online payment will be secure? iGO Rewards is equipped with a secure payment gateway, and will initiate a 3D secure fraud protection verification (Mastercard SecureCode) or Verified by Visa or American Express SAFEKEY as part of the online booking process. A One-Time Password (OTP) will be sent to the Principal Cardholder’s mobile phone and this OTP will be used to verify the Cardholder’s identity and authenticate the transaction during the booking process. Is there any booking fee in iGO Rewards? A non-refundable Booking Administration Fee of HKD50 will be added to each booking transaction. This fee can only be paid using the same DBS credit card you signed in with. What are the service hours of iGO Rewards Travel Services Centre? iGO Rewards Travel Services Centre is open from Monday to Friday 10am – 8pm, Saturday 9am – 1pm Hong Kong time, excluding Sundays and Public Holidays. You can leave your inquiry outside of service hours via voice message or email to contact@iGOrewards.com.hk. Our Travel consultants will reply in the next business day. If you have successfully made a booking and see the booking confirmation page and Booking Reference Number on screen but do not receive an email confirmation within the next 2 hours, or your e-ticket or e-voucher in the next 24-48 hours, your email could be caught in an aggressive spam filter. Please check your spam folder. If you are still unable to locate the confirmation email / e-ticket / and vouchers, please call the iGO Rewards Travel Services Centre on 3192 7676 during service hours. If you have submitted a booking but do not see the confirmation page, please call the iGO Rewards Travel Services Centre on 3192 7676 during service hours. What should I do if I’ve misplaced my flight e-ticket or hotel voucher? You can go to ‘My Bookings’ in the user menu on the left hand side of the header on iGO Rewards website to re-print your itinerary and hotel voucher. To obtain a copy of your e-ticket, please call the iGO Rewards Travel Services Centre on 3192 7676. Can I earn DBS$ or COMPASS dollar from the payment of my booking in Hong Kong dollar with DBS credit card? Yes. The Hong Kong dollar component in a booking paid by DBS credit card is eligible to earn DBS$ or COMPASS dollar. * Eligible flight tickets is subject to flight ticket’s fare class governed by airlines. All amendments and cancellations to flights can be made via the iGO Rewards Travel Services Centre on 3192 7676 or contact@iGOrewards.com.hk by email. If you require an urgent change to your flight outside of the iGO Rewards Travel Services Centre’s service hours, please contact the airline directly. Amendment and cancellation fees can vary by supplier and will be advised by your travel consultant of Travel Services Centre at the time of your request. In addition to the supplier’s amendment or cancellation charge, an iGO Rewards Amendment / Cancellation Fee of HKD250 will be charged per request. The DBS$ and Hong Kong dollar component used in original booking will be used to offset 1) Supplier’s amendment & cancellation charge (if applicable) and 2) iGO Rewards Amendment / Cancellation Fee. Please note that it is possible that total amendment or cancellation fees could exceed the cost of the original booking. When a booking is cancelled, the DBS$ or COMPASS dollar, less any applicable Cancellation Fees, will be held in credit by iGO Rewards for you to make another new booking. 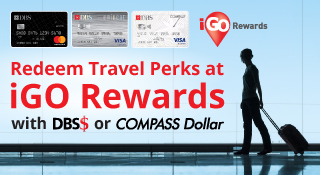 These DBS$ or COMPASS dollar must be used for one new booking via iGO Rewards Travel Services Centre within 12 months from the date of cancellation, failing which it will be forfeited. The Hong Kong dollar component, less any applicable Cancellation fees, will be refunded to the DBS credit card account that was used at the time of booking. The Booking Administration Fee of original booking is non-refundable. I have special needs when I travel. Will my online iGO Rewards booking cater for these? If you have special needs, please call the iGO Rewards Travel Services Centre to discuss your special service request before proceeding with your booking online (please note that bookings cannot be made via the Travel Services Centre). iGO Rewards Travel Services Centre can be contacted via phone on 3192 7676. What type of compatible browsers is this website best view from? This website is best viewed with the following supported browser types and versions: Internet Explorer 11 or above versions, Firefox (latest non beta version), Chrome (latest non beta version). For compatible browsers like the Safari Desktop (latest version), some features may not be available and / or presentation may be less than optimal, however eligible cardholders will still be able to complete a booking.